Our last evening in London was spent with a dear friend from Moscow who moved to London last year to start a new life. We agreed to meet at Olivomare, the third and newest of the Sardinian restaurant group which started with Olivo. Olivomare opened in spring 2007 after the success of casual Oliveto, which I have been to several times over the years. 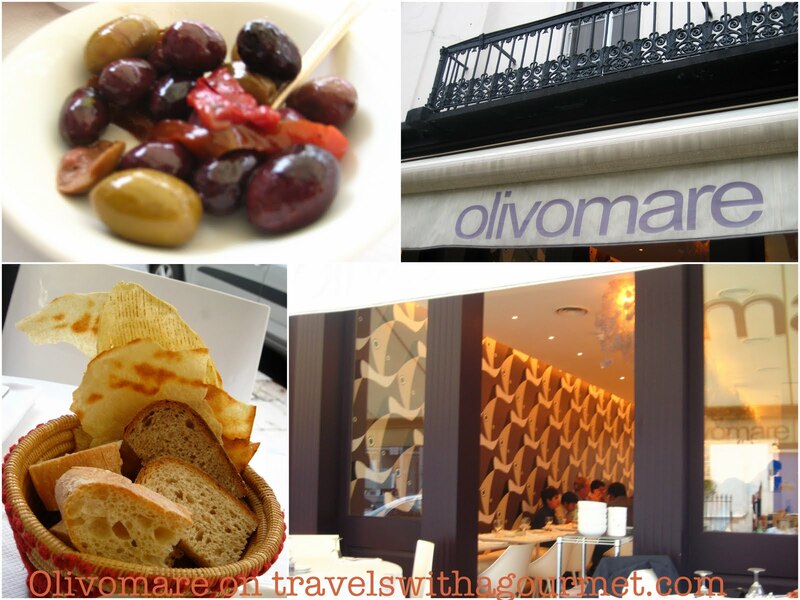 Located in Belgravia where the other two Olivo restaurants are, it is more similar in ambiance to casual Oliveto. Alongside the restaurant it their deli/wine shop Olivino which makes it convenient as a pantry for all three restaurants. We arrived early and opted to sit outside as it was a surprisingly warm evening. While we waited for L to arrive, we were served olives, a basket of assorted bread and a Sardinian aperitif (similar to sherry). Our table right by the street was ideal for people-watching and seeing all the diners arriving at the restaurant. Service was attentive and courteous and the Italian waitstaff weren’t in a hurry to take our order as they could see we were enjoying our conversation. L arrived soon after and looked fantastic (it seems that London life suits her). As we dug into the bread basket and olives and proceeded to catch up on each other’s news, we also glanced at the menu quickly and decided what we were going to have. 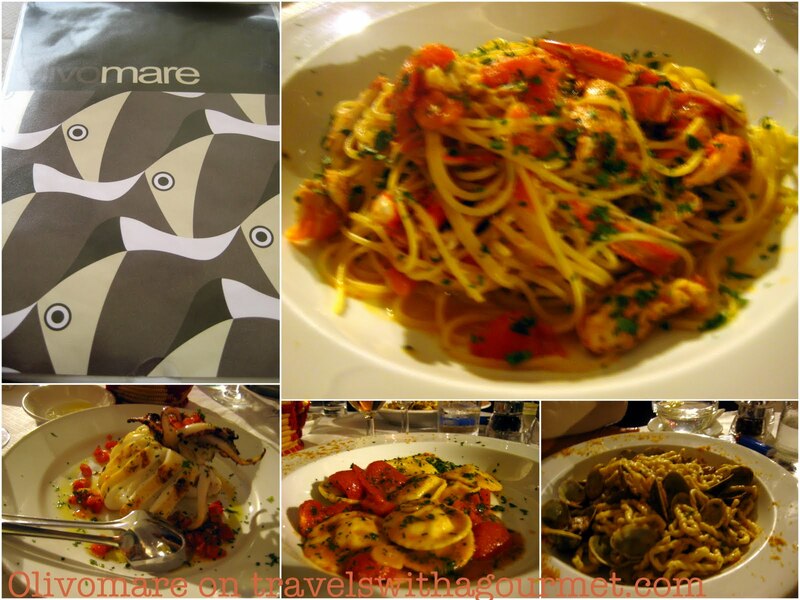 Olivomare is a seafood restaurant, hence the name, with Sardinian specialties. To start we shared the grilled calamari farcitti alla griglia (grilled stuffed baby calamari) – sweetly tender squid char-grilled and filled with chopped fresh plum tomatoes and shredded basil – an excellent plate to share between friends. We also asked the charming Italian manager to choose a white wine for us and he suggested the Sardinian 2007 Contini Karmis Vernaccia. The restaurant started to fill up by then and all tables were occupied, even the few that were set up outside. As we enjoyed the cold wine, our main courses were served. Pasta for all of us – raviolini alla coda di rospo (monk fish ravioli) for L, lorighttas con vongole (traditional hand-made pasta with clams and grey mullet roe) for T and the special linguine with scampi (Dublin bay prawns) for me. My linguine dish was filled with several scampi that I had to crack and dig in to get to the sweet prawn meat hidden inside. L’s ravioli were filled with monk fish and that salty Sardinian ingredient – bottarga (grey mullet roe). T’s dish was not the typical dried pasta but fresh pasta resembling twisty noodles tossed with clams and also flavored with bottarga. All three dishes were al dente, delicious and served with a simple sauce of fresh chopped tomatoes – a true taste of summer. Catching up with friends takes time and before we knew it, it was already past 11:00 and the restaurant was emptying out. Some of the waiters shifts were over and a few were outside enjoying after-work cigarettes. The manager was still there though so we ended our dinner with two scoops of homemade sorbet – lemon and strawberry – and very short espressos. As we said our goodbyes, we promised to keep in touch and see each other very soon, hopefully in London again for another fun dinner among friends.